I love Ben & Jerry's ice cream. I also love peanut butter so yes I truly enjoy this ice cream. My husband loves almost any chocolate ice cream with peanut butter. He usually smears peanut butter on the sides of his bowl and then puts chocolate ice cream or chocolate peanut butter cup ice cream in it. He did not care for this one as he said I liked the other brand you bought last month better. I love chocolate but I'm not a fan of chocolate ice cream so I didn't try it. 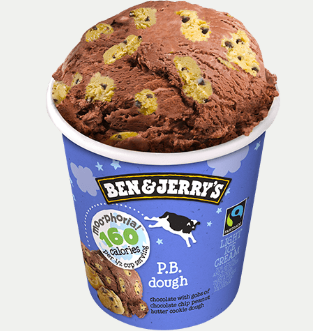 This is a lighter version of Ben & Jerry's ice cream. The package describes it as "Chocolate Light Ice Cream with Gobs of Chocolate Chip Peanut Butter Cookie Dough." Six of us gave this a try, and reactions were pretty positive. Very chocolatey! Some of us didn't love the texture, but the flavor overall was good. It's worth a try!